Cecilia Fox | Weekly Record Herald EMT Megan Holfinger accepting her award from EMS Chief Jeff Calicoat last week. 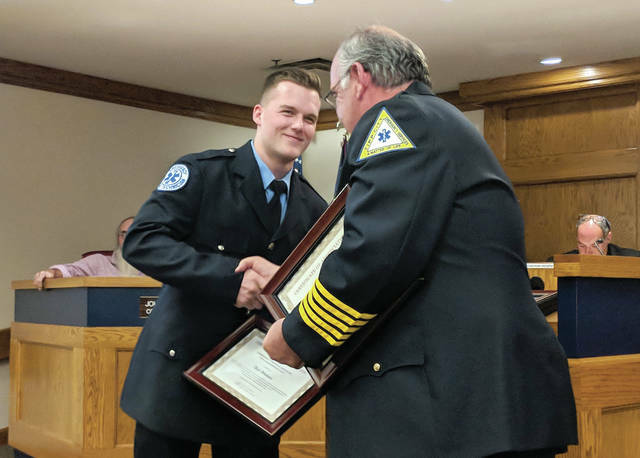 Cecilia Fox | Weekly Record Herald EMT Nick Woolever was presented with a certificate by EMS Chief Jeff Calicoat at a recent city council meeting.  Cecilia Fox | Weekly Record Herald EMT Daniel Shoup was a member of the emergency medical team recognized for saving a life last month. TIPP CITY — A local team of first responders has been recognized for its role in saving someone’s life. 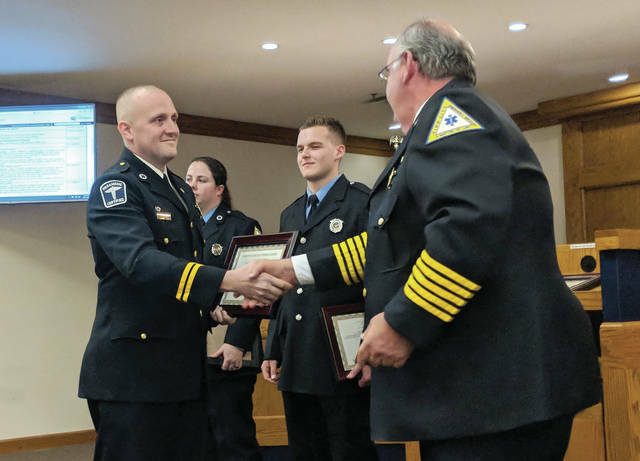 Tipp City EMTs Daniel Shoup, Nick Woolever, David Stockler and Megan Holfinger were awarded certificates of appreciation from Tipp City Emergency Service. Justin Palmer, an EMS coordinator with Grandview Hospital, presented the crew with challenge coins from Kettering Health Network. On Aug. 24, an EMS crew responded to a call about a “man down and not breathing” at Harrison’s Restaurant on Main Street. “The four individuals that we are recognizing, between use of CPR and (defibrillation), were able to revive the patient and deliver them to Grandview Medical Center,” EMS Chief Jeff Calicoat said. After treatment, the patient was able to go home a few days later, he added. Kettering Health Network has started offering challenge coins to area emergency medical teams that do an “outstanding job,” Calicoat said. Palmer said that Kettering Health Network started the recognition program to highlight the hard work and successes of emergency medical crews. Mayor Joe Gibson called the emergency a “cardiac event.” Data from the American Heart Association shows that 90 percent of people who suffer out-of-hospital cardiac arrest die. “Because of the quick action of our EMS crew, the individual involved survived,” he said. https://www.weeklyrecordherald.com/wp-content/uploads/sites/51/2018/09/web1_IMG_20180917_194146.jpgCecilia Fox | Weekly Record Herald EMT Megan Holfinger accepting her award from EMS Chief Jeff Calicoat last week. https://www.weeklyrecordherald.com/wp-content/uploads/sites/51/2018/09/web1_IMG_20180917_194129.jpgCecilia Fox | Weekly Record Herald EMT Nick Woolever was presented with a certificate by EMS Chief Jeff Calicoat at a recent city council meeting. 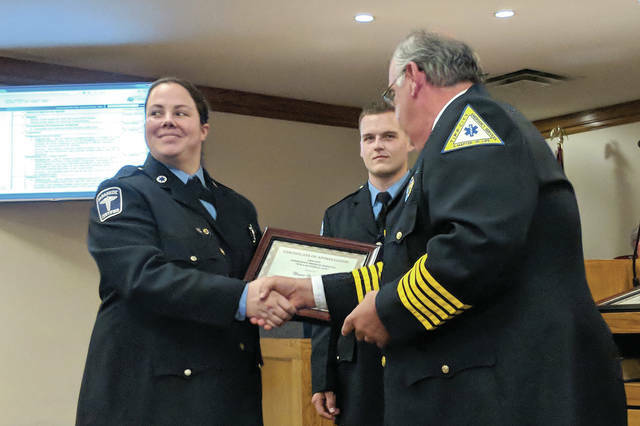 https://www.weeklyrecordherald.com/wp-content/uploads/sites/51/2018/09/web1_IMG_20180917_194200.jpgCecilia Fox | Weekly Record Herald EMT Daniel Shoup was a member of the emergency medical team recognized for saving a life last month.